We used to recommend all sorts of books on website design and html and css coding. However, one of the big problems with having a personal library of coding books is that every couple of years they become obsolete. Accordingly, we no longer recommend paper books for learning how to code. For more in-depth help on coding PHP, we recommend PHP.net. Click this link to learn about the Bootstrap Platform, which has great explanations of the bits and pieces of Bootstrap; it is also where one downloads the various pieces of it. Also note, one can always ask a coding question of Google, which usually does a yoeman's job of answering helpfully. Disclaimer: If you buy books through our links to Amazon we'll make a small commission on your purchase. Note that we don't recommend books unless they've actually helped us. This book, "How to Sell, Clear and Simple" really lives up to its name. 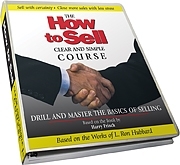 Anyone ought to be able to read and apply the material from this brand new book by master salesman Harry Frisch to sell more, faster, smoother and with fewer headaches and heartaches. You can forget what you've learned elsewhere about sales (you probably suspect most of it was false or unnecessary anyway!) this book teaches you what you need to know to sell with a clear conscience and stay on top of the sales game with good communication. This has become my all-time favorite book on sales, better than "Big League Sales Closing Techniques" by Les Dane, which I also recommend, and on which I drilled daily for years when I was in sales "back in the day". This new book is a very good value at $29.95. There's no question: if you sell for a living or if some aspect of your job involves contacting people and getting them to do things, buy this book today and learn to master the process that leads to closing more sales, building more future business, and satisfying customers beyond their expectations. Based on the works of L. Ron Hubbard. Note this is the 2nd Edition, which was updated and expanded from the original—the first edition sold out quickly. This book is unique in that it is the only one I've seen that is like attending a seminar. It's written and illustrated in that succinct seminar format, complete with examples, as if a great public speaker were delivering the information to you directly. It has illustrated solutions to the kind of real business problems you face every day. Problems like, "How come I'm drowning in things to do, but not enough production is happening?" or "I've got three employees in that area and I must lay one off. Which one?" or "What exactly do I need to actually do, in order to reach a goal I've set?" or "Statistics are level with last year. What do I do?" Based on the works of L. Ron Hubbard. You can buy copies of it new or used, from $2.00 to $36.00 at Amazon. This book makes you re-think and question everything you thought you knew about marketing. It is usually under $20.00 at Amazon The 22 "unchangeable" laws of marketing deal with what people think about products or services or companies - if you need to know that sort of stuff, then this book is for you. Read it, even if you have to check it out of the library. Fasten your seat belts for a first class head trip! Sergio Zyman was the guy who thought up "New Coke" in 1985 - widely regarded as the greatest marketing blunder of all time. Or one of the most brilliant marketing moves ever made (according to the results!) depending on how you look at it. While dishing out delectable bits of gossip (you'll find out why Madison Avenue ad agencies called him "The Ayacola") he manages to build a solid case for something I've been preaching for 30 years: Marketing is not some arcane art performed in a vacuum - marketing has to produce a measurable product or it's useless, wasteful, and should be stopped. By "measurable product" Zyman is talking about SALES. Finally, someone is speaking sense from within the loony bin that was marketing in the 20th Century. One cannot hope to learn all there is to know about advertising from a single book. But this book goes a long way toward teaching you the basics of what works and what doesn't work to sell products in an advertisement. Since commercial websites are, or should be, advertisements for the products or services you sell -- this is a must-read. Trust me on this. Just buy it and read it. Find out why you will never, ever put red text on a black background on a web page again. 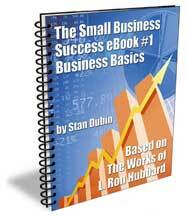 Highly recommended for anyone doing website design or marketing or online advertising. To order, click on the picture of the book. This book is out of print. Do not despair, though, you can -- no, you SHOULD -- get a copy of this book and read it. You can usually find it used at Amazon (click the picture of the book) or at www.powells.com, the huge Powells bookstore in Portland, Oregon -- they may be the largest used book dealers in the world. I bought a used copy of this book for $12.00 from them, in excellent condition, and I've read it three or four times and learn something new every time. What can I say about this book that hasn't already been said? It was written in 1935 and it is still in print, which has to tell you something. It has a small but useful set of rules about how to write. How useful? Extremely. If you want to write well, use the guidelines in this book. It's a very easy read, not your normal English book or book on style. There's nothing else like it. The rules are clear and definite and you should follow them. You will write better just from having read it. I try to follow these rules even if I don't always succeed. Dean Blehert is unquestionably America's premiere satiric poet. In this book he skewers every sacred cow from American and English poetry, hilariously and with formidable wit and panache. If you were ever forced to read Longfellow or Poe and pretend to admire them to get a good grade, you'll howl at his rendition of "Song of Hiawatha" and "The Raven." This book could well be the text book for a college course in English Lit, but academic America is unlikely to pick it up because... well, he flays them, too, exposing the rotten core beneath the lifeless exterior of the literature of academia. As Dean says, his poetry won't save you, but it may locate you until a rescue party can be sent out. Here's a sample where Dean tries to sell his soul to the Devil in exchange for fame and glory. by Jere Matlock - $12.95 softcover (plus $3.00 shipping and handling) from Words in a Row. Over 100 poems, 93 pages. A collection of poetry from the 70's to present time, mostly about love and family. Understandable poems that make a good gift for someone you love, someone who has had trouble in love (who hasn't?!) or someone who just likes poetry. From the preface: "It occurred to me at an early age that it is not enough to mirror reality in descriptions of it, or to set down impressions of the way people behave, or the look of a thing -- even if it has never been said before. That kind of pointless commentatorism can go on endlessly. In my view, poetry ought to pull the attention out -- make someone more alive for having shared it with the poet. It should show, wherever possible, how we are at cause and leave one reminded, in some way, that we can be at cause over this world we're in, even in matters of love. We have enough messages already concerning the beautiful sadness of things, and we do not need more poets selling us on hopelessness, apathy, futility and the like. I've made an effort not to do that; whether that effort was successful I leave to you." To see some sample poems from the book, click here.